Welcome to Grand Island, Nebraska, a community focused on growth. We’re home to an educated, driven workforce, direct access to transportation, and a business culture built on strong relationships. 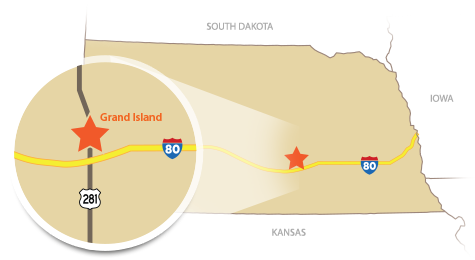 With connections to major highways and Interstate 80, access to Grand Island is easy, convenient, and cost-effective. You'll have dual-rail service from Union Pacific and Burlington Northern Santa Fe, plus direct access to a commercial service airport. The ideal location for your business. Few places offer direct access to transportation like Grand Island. But our unique central location is only the first thing that sets our city apart. We're home to a diverse workforce with sites and facilities ready for your operation, all backed by people who believe strong relationships are the key to building great businesses. Each day, 118 trains pass through Grand Island. Dual-rail service from Union Pacific and Burlington Northern Santa Fe is a valuable feature and ideal for a manufacturer or distributor. Our transportation options don't end there; Grand Island offers connections to major highways and Interstate 80, plus access to a commercial service airport. Building relationships, focused on growth. Grand Island is home to an energetic business culture, filled with people who believe strong relationships are the key to building great businesses. The GIAEDC is actively involved in our business community and proud to support our members. Become a member and our progressive business community. We work alongside our members, developing business opportunities, improving our workforce and making Grand Island a better place to do business.